A new customer called us after she had her dryer vent cleaned by a well-known competitor of ours 6 months ago. She needed her clothes dryer vent cleaned again and just wasn’t happy with the service she received from the competition. She didn’t believe she received quality dryer vent cleaning the first time around. We opened the false ceiling in her basement and found this. 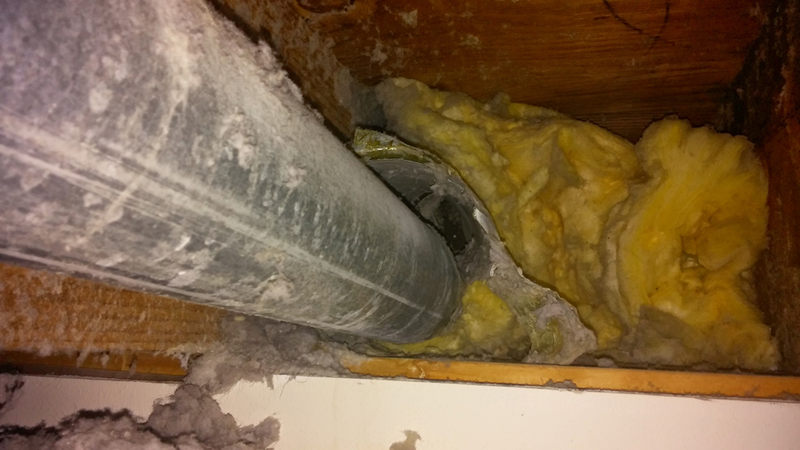 Turns out her clothes dryer vent was in fact cleaned, but the previous cleaner failed to check that the duct was connected to the exterior vent. Not only was 6 months of lint blowing directly into her basement, but she and her family were exposed to dust and venting gas. There was also water damage from the parts being disconnected. You can trust Healthy Living Air Duct Cleaning to inspect the entire clothes dryer vent to make sure it gets clean, but also that it is properly connected when we leave. Call us today if you need your clothes dryer vents cleaned.